But, before we start, credit where it’s due. Check out this post highlighting two papers presenting the original internal design and architecture of the Eucalyptus and OpenNebula cloud management platforms. Really proud to be there for our users from the very beginning of Cloud Computing! The OpenNebula team is preparing the next upcoming release (yes, we are relentless! ), currently discussing the roadmap taking into account the user’s feedback. This release will polish past features as well as address those left aside in OpenNebula 4.6 Carina. 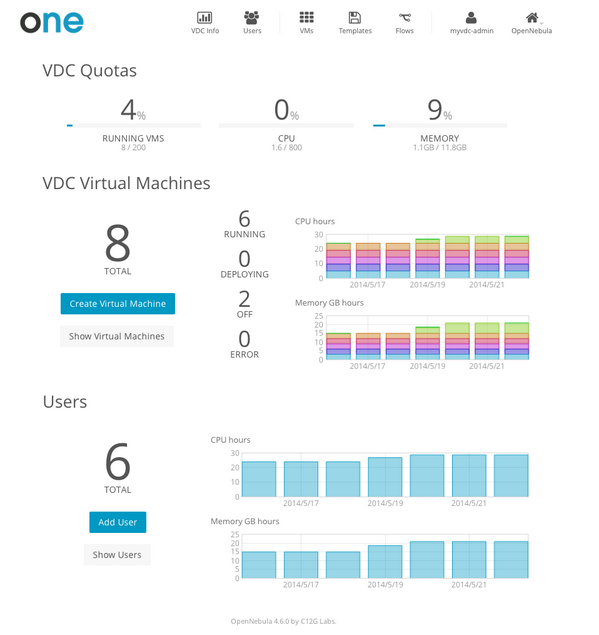 One of the main features would be a new graphic interface for the Virtual Datacenter administrators (sneak peek below). Also, hybrid cloud support will be addressed, with two new plugins on the works. A partnership with IBM/SoftLayer has been announced this last month, and a prototype to manage SoftLayer Virtual Guests using OpenNebula is on the works. The same plan applies to other leading cloud provider, a partnership will be announced soon and a prototype will be ready shortly! Good news for the community, more choice to the cloud users and administrators. And did we say relentless? More partnerships and more public cloud provider support are being crafted …. Meanwhile, and as part of our commitment with the latest stable version, OpenNebula 4.6.1 Carina was released. This release (4.6.1) comes with several bug fixes found after the latest release, namely bug that prevented VM monitoring information purge (which increased exponentially the disk usage in the OpenNebula front-end) and a Xen related bug affecting VNC. Moreover, OpenNebula 4.6.1 brings a new long overdue feature to the table: accounting information in Sunstone!. Isn’t it pretty? Two new versions of the excellent Addon, AppMarket 2.0 and AppMarket 2.0.1 were released. These releases are part of the AppMarket 2.0.x series, which extends the AppMarket functionality by adding a new set of features that enables the management and processing of OVA files. A new component AppMarket Worker is introduced, which handles the OVA package treatment (download, unpack, OVF parsing) and image format conversion. This release also features a new API, a new simplified import dialog, a new AppMarket interface via Sunstone, and handles VMware and VirtualBox OVAs. OpenNebula community has been very active, producing high quality feedback to iron out the wrinkles in OpenNebula 4.6. This feedback was crucial in releasing OpenNebula 4.6.1, which fix bugs present in the first Carina version. It seems that the upgrade process is streamlined (as stated here,here and here ;) ), and overall the feedback on the new version was very positive! It is also worth highlighting the smallest box containing a full fledged OpenNebula cloud. It is small, it is powerful, it is pretty: meet the smallest Cloud Weavers!. Also, this kind of feedback from the OpenNebula users makes us blush and happy, and willing to keep OpenNebula in the right track! A very cool integration between OpenNebula and The Foreman has been developed by the guys at Netways. It can be used to deploy virtual machines within OpenNebula using the Foreman interface which configures DNS,DHCP,PXE,Puppet and so on as well. The functionality is covered by using and extending the ruby fog library. As usual, first things first, this year’s OpenNebula Conference will be held in Berlin as well, 2-4 of December, 2014. If you want to repeat or find out how it is for yourself, save the date! The Call for Papers and early registration prices are open until the 15th of July, don’t say we didn’t told you! Last month we organized a Hands-on Tutorial in the EGI Community Forum, Helsinki, Finland. On the same event, a workshop about cloud architecture was held, where users shared their experiences with OpenNebula. Another, more complete, 2 days OpenNebula administration course was given in Madrid, Spain, jointly with CENATIC. Also last month, guys from OneInsight presented their visualization plugin for OpenNebula in the CentOS Dojo in Lyon. Check it out here. This year’s LinuxTag also featured OpenNebula, The Foreman and CentOS, this time presented by guys at inovex, and your favorite CMP was also presented in the Secure Linux Administration Conference 2014. We are setting up a number of OpenNebula TechDays around the world. These events are designed to learn about OpenNebula with a hands-on cloud installation and operation workshop, and presentations from community members and users. If you are interested in hosting or sponsoring one, let us know!. There will be two OpenNebula TechDays in the upcoming months in the USA, covering both the east and the west coast. The one in Florida will take place in Boca Raton the 19th of June, hosted by TransUnion, whereas the west coast will be covered by the Bay Area Techday the 24th of June, hosted by Hyve, which includes an exciting tour around the manufacturing plant of Facebook production racks. These events have so far confirmed speakers from IBM, inktank/RedHat and, of course, form the OpenNebula Project.